Betting on the Super Bowl has become as American as apple pie. But I’ll bet (ha-ha) you don’t really know how much is wagered. I didn’t. Ready for this? In 5 of the last 8 years, the Nevada handle (the total amount of money wagered on an event over a period of time) has topped $90 million. 90 MILLION DOLLARS! That’s a lot of pie. Point Spreads – This is a very popular style of football bet where you wager on a team covering a given point spread. For example, if the New York Giants were given a spread of +3.5 in the Super Bowl, they’d need to lose by less than three points or win the game in order for their bettors to win. 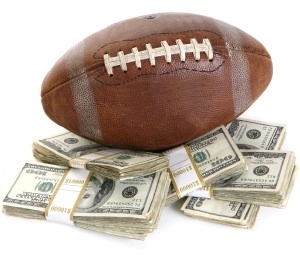 Money Line Bets – Here you are only wagering on which team will win the Super Bowl. However, there’s always a favorite so odds are attached to each team to keep betting equal on both sides. For example, if the Giants were the underdog, you might win $2.20 for every $1 wagered; meanwhile, those betting on the favorite might only win $1.60 for every $1 bet. Over/Unders – Rather than betting on which team will win the 2013 Super Bowl, you could always wager on the combined score of both teams. So if the over/under on the game was 35.5, you could either bet on the two teams scoring more or less than this amount. The fourth category known as prop bets is what people seem to really chase. A prop bet is basically a wager that is made on something other than the outcome of the actual game. There are team prop bets, like which team will score first and there are individual player prop bets, like how many yards will Joe Flacco throw for. There are even some really funny entertainment style prop bets associated with the Super Bowl, like how long it will take Alicia Keys to sing the National Anthem (the over/under is at 2 min. 15 sec. ); or what will be the highest tweet per second during the Super Bowl; or if the Ravens win, and Ray Lewis is interviewed after the game, how many times will he mention the words “God or Lord” (the over/under is at 3). You can bet on what the Dow Jones will do the day after the game. You can even place a bet on how much money is going to be bet on the Super Bowl! Check out these team prop bets and player prop bets courtesy of Bovado. Here’s a list of the crazy entertainment prop bets courtesy of blog.sfgate.com (via Bovado). I was blind as to how many options were available. There seems to be no-limit – truly something for everyone. No wonder the handle has reached over $90 million recently. That, paired with the fact that you can set up an online account and go all-in from home, makes it really easy to venture in with the sharks. If you wanted a spicy start to Super Bowl XLVI, you got it, as the Giants drew first blood when a Tom Brady throw from his own end zone drew a flag, a penalty for intentional grounding and a 2-0. Despite the lure, the excitement and the potentially big payoffs, I will choose to be a railbird*. I have enough trouble getting worked up at players statistics during fantasy football season. I don’t need the tension of hoping Frank Gore can score three touchdowns so I can cash out big. Besides, I like the odds of my money staying with me. Vegas has enough already. Will you be placing a Super Bowl wager? Do you consider gambling part of your entertainment budget? *a non-participatory spectator in a poker game. How many other poker terms can you find in this post? I don’t really gamble so I don’t know any poker terms, but that is a crazy amount of money spent. I guess if that is your enjoyment, but I’m afraid it’s probably a whole paycheck for many people. It is a lot of money. I’m trying to figure out if someone had a bet on the lights going out during the game. Let the conspiracy theories begin. I’ve never been a gambler…I hardly even did the slots in vegas! I just hate losing money on seemingly nothing at all. But I will have an oscar party with a $5 buy in and winner takes all on who gets the most right. Does that count? 🙂 But see I think there is some skill on the part of the player, instead of leaving things to chance. I love how social media has become part of the game now too. It makes it more fun for me because I’m not a huge, ok not a football fan at all. Enjoy sunday! The party sounds fun. And I do think you are right in that social media has helped draw people in that would otherwise not be interested. Have a great weekend! I don’t gamble except when my husband and I bet on the Golden Globes or miniature golf. But you’re right–people can bet on everything! One year, we had a friend who bet on the coin toss (the coin toss!) and won over $1000 before the game even started. It was ridiculous. This is actually the first year I care about the Super Bowl. But that’s only because Joe Flacco graduated from my alma mater and it’s a pride thing. That’s a nice way to begin a Super Bowl party…$1000 richer. I like Flacco but the whole Ravens organization gives me a bad taste in my mouth. I’m a Browns fan and am still frustrated the owner moved the team to Baltimore in the ’90s. We haven’t been the same since. I am familiar with the prop bets and always enjoy reading them to see which one is the craziest. The most I bet on the game is a few dollars with my Dad. We’ll put $5 on a team. It’s simple and fun. I was laughing the whole time I was reading that list. Awesome that you can enjoy that fun experience with your Dad. I have a $0 entertainment budget this year, so was going to rely on “fun” betting using potato chips or other food. I didn’t know there was so much betting going on and the different kinds. Thanks for the info. I will definitely pass this on to a few other people that might be interested. I think I would go crazy with no money in my entertainment budget, especially trying to entertain our four kids! Awesome that you are this focused! I was surprised as well. I’m with you…I’ve have much better things to spend my money on.